Recently, my boy's daily bento consists of lesser white rice other than the sushi and fried rice. The latter, being one of his favourite, will certainly be included in his lunch occasionally. 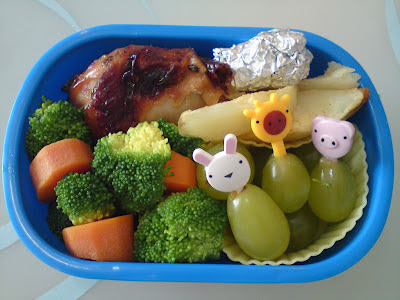 This bento was prepared yesterday with baked red fermented beancurd chicken drumstick, blanched broccolli/carrot, baked fries and grapes. No rice!! I love the red fermented bean curd aroma coming from my oven when I baked it. We had the same during dinner and the two monsters (Papa and my boy) clean up the drumsticks in seconds. Towards the end of the week, I always run out of ideas and also there is not much ingredient left in my fridge. I wanted to make wholemeal crepe with scrambled egg fillings but failed to do so. Because the crepe is too thick and heavy to be rolled. And the result, haha, I use the heart and star shape cookie cutter to cut it from the 'crepe' and lay them nicely in the lunchbox. On other side is scrambled egg with cherry tomatoes, onion and green pea and the other end are apples and grapes. Plus a vitagen drink. I know it look more like a breakfast rather than a lunch. I mentioned in my earlier blog that I went preschool hunting. The first kindergarten I visited is Bethesda Katong kindergarten after seeing so many good reviews from the internet. It was founded in 1953 and we met the principal, Ms Irene Wee, who gladly showed us around the teaching classes, music class (instructor was formerly taught in kindermusik), art and craft, assemble hall, computer room..etc. It has quite a sizeable outdoor playground with sandpit that I like. The morning session 8.15am to 11.15am are full now. It left with only the afternoon session 11.30am to 2.30pm which I am not keen at all. We observed that some children idle around before moving to the next lesson/classs whilst waiting for the weakest one to finish the homework. Somehow, we felt that there is something lacking i.e. 'energy' and 'enthusiasm' personally (without prejudice). Probably, it is pure coincidence or the wrong timing of the day, I am not sure about it. Well, the other preschool in our list is Soka Kindergarten and we are going to their open house which falls on 11 March 2012. On not so bright side, my son is not willing to change school when we talked to him about it <haiz>.